This digital artwork of an abstract funky flowers is a combination of photography and photo manipulation. I took the original flower photography at a zoo that I had visited while in California. This unique digital artwork is available in a number of print options, such as canvas print, framed print, poster, metal print, acrylic print, and wood print. 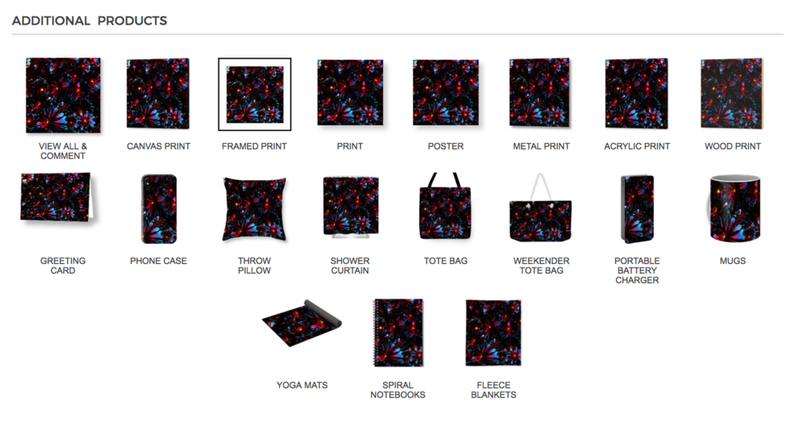 It is also printed on a variety home decor items, such as greeting cards, phone case, throw pillows, shower curtain, tote bags, coffee mugs, yoga mat, notebooks, fleece blankets, and more. Below is just a sample of the items available. Click on the button below to see all available items in this collection. This fun digital artwork collection of abstract funky dark flowers is available on a variety of wall art and home decor options, such as canvas prints, acrylic print, show curtains, greeting card, phone case, yoga mat, tote bag, coffee mugs, spiral notebook, and fleece blanket.